Owner JP McManus dominated in the Ladbrokes Handicap Hurdle on the opening day of the Dublin Racing Festival at Leopardstown on Saturday. 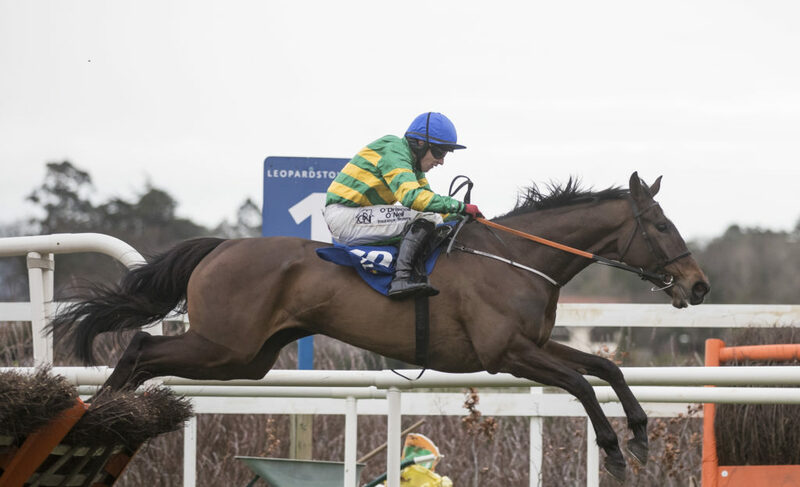 A winner with his big Champion Hurdle hope Buveur D’air at Sandown on the same afternoon, McManus had his colours fill the first three places in the €125,000 Leopardstown race. And just as he did last year, Off You Go landed the spoils for trainer Charles Byrnes when flashing home in the closing stages to get up under Mark Walsh for a length success. McManus’ former Champion Hurdler Jezki and former Triumph Hurdle winner Ivanovich Gorbatov battled it out from the furlong marker with Jezki just getting on top in the closing stages. McManus was also a winner with the Joseph O’Brien-trained Sir Erec in the Grade 1 Tattersalls Ireland Spring Juvenile Hurdle. The brilliant mare Apple’s Jade lit up the opening day of the Dublin Racing Festival on Saturday and it appears that the racing public will get their way and she will take her place in the Champion Hurdle at Cheltenham next month after all. Less than 24 hours after her emphatic victory under Jack Kennedy in the BHP Insurance Irish Champion Hurdle, trainer Gordon Elliott announced the she will be targeted at the Unibet Champion Hurdle, just hours after connections appeared to play down the chances of her taking on dual winner Buveur D’Air. Elliott added: “Up until yesterday I’d have been very nervous [about going for the Champion Hurdle] but to do what she did here yesterday was very good. 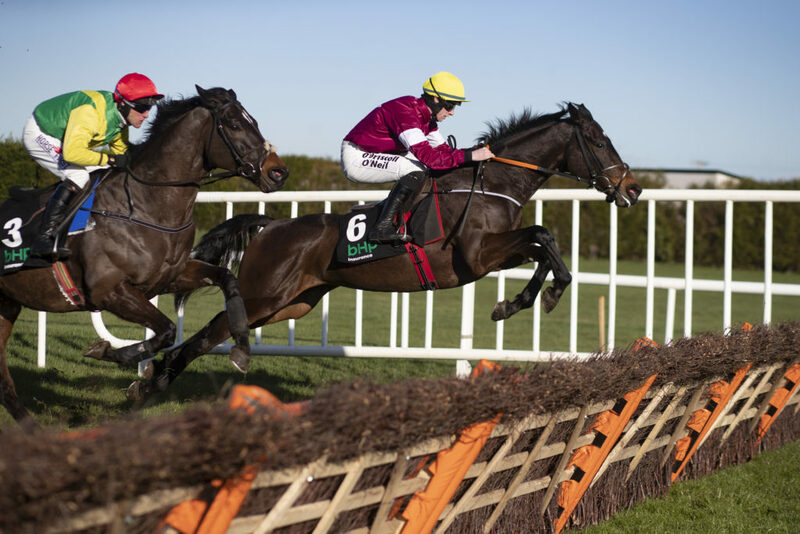 She loves a battle and I think Cheltenham would suit her better than Leopardstown.” Apple’s Jade, who finished a disappointing third in last year’s Mares’ Hurdle at the Cheltenham Festival, is now disputing favouritism in the Champion Hurdle market with two-time victor Buveur D’Air, as short as 6-4 is some lists. Elliott and Kennedy also captured the Nathaniel Lacy & Partners Solicitors Novice Hurdle at Leopardstown on Saturday with Commander Of Fleet which battled to a narrow success over the Joseph O’Brien-trained Rhinestone. Envoi Allen completed an Elliott treble under Jamie Codd in the Grade 2 Matheson Bumper while there was Grade 1 success for Willie Mullins and O’Brien with Min and Le Richebourg respectively. Paul Nolan and Bryan Cooper combined to land the concluding Goffs Handicap Chase on the opening afternoon with Quamino. Mullins was the big winner on the second day of the festival when recording top-level success in the Chanelle Pharma Novice Hurdle with Klassical Dream and Bellshill, a tenth winner in the race, in the Unibet Irish Gold Cup. They were guided to narrow victories by Ruby Walsh who was certainly seen at his remarkable best on both occasions. The Charles Byrnes-trained Off You Go landed a second successive success in the Ladbrokes Handicap Hurdle, this time coming late to score under Mark Walsh and leading home a 1-2-3 for owner JP McManus. McManus was also a winner with the Joseph O’Brien-trained Sir Erec in the Grade 1 Tattersalls Ireland Spring Juvenile Hurdle while Lambourn trained Warren Greatrex took the Grade 1 Flogas Novice Chase with the promising mare La Bague Au Roi which was ridden by Richard Johnson. There were three County Meath-trained winners on the day, Shane Crawley won the Irish Stallion Farms EBF Paddy Mullins Mares Handicap Hurdle with Sassy Diva, Elliott landed the William Fry Handicap Hurdle with Dallas Des Pictons and Dermot McLoughlin landed the final bumper with Santa Rossa. The Abbey International Leopardstown Handicap Chase went the way of the Jessica Harrington-trained Whisperinthebreeze, which was ridden by Jack Kennedy’s brother, Paddy. Apple’s Jade and Jack Kennedy wing a flight when winning the BHP Insurance Irish Champion Hurdle (Grade 1). Leopardstown. Photo: Patrick McCann/Racing Post 02.02.2019. Horse Racing Ireland have announced the 2018 Irish horse racing and breeding industry figures which confirmed a continuing trend towards racehorse ownership in Ireland. New owner registrations were up 16.2% year-on-year with almost 800 new owners registering with Horse Racing Ireland. This contributed to another increase in horses-in-training, up 2.4%, in the country. HRI Chief Executive, Brian Kavanagh, said: “Increasing ownership was one of the main priorities for Horse Racing Ireland in 2018 so it is pleasing to see that strategy pay off with significant increases in the number of new owners, total owners and the consequent increase in horses-in-training. This will be felt by trainers all over the country with syndicate ownership rising 33% year-on-year. Owner retention is over 73%, the highest rate it has been since 2007. On the track 2018 was a successful year for Irish racing with 17 Irish-trained winners at the Cheltenham Festival and Irish-trained horses filling five of the first six places in the Aintree Grand National, including the winner Tiger Roll. On the Flat, Aidan O’Brien won three of the five English Classics. The industry continued to perform well, though bloodstock sales struggled to keep pace with recent strong returns, with Brexit uncertainty clearly impacting investment. Accordingly, the gains made in 2017 were reversed in 2018, becoming the first time in nine years that bloodstock sales at public auction in Ireland did not post an increase. Commercial race sponsorship continued to rise strongly, growing by another 5.3% in 2018, while Irish European Breeders Fund (EBF) support grew by 11.1%.